Pandamensional Solutions, Inc., 9781938465031, 204pp. Do you want to see how the drive to living a comfortable retirement is easier than you think? 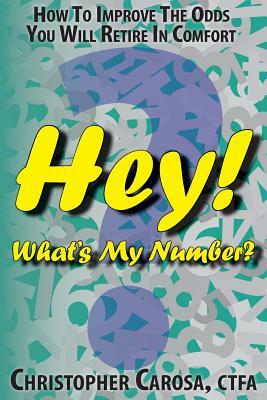 Buy this book to learn: Hey What's My Number? reveals a four-step process that gives you a clear, easy-to-understand road map to that comfortable retirement. It features a never-before-seen Hey What's My Number? "Retirement Readiness" calculator that acts like a check engine light for your retirement savings vehicle. Several advantages set this free web-based tool apart from the many "retirement" calculator clones every broker insists you use. For example, the only data you need is already at your fingertips. You don't have to guess how long you expect to live (no one really knows that anyway). You don't have to guess the future direction of key economic data like inflation, market returns, and the nation's GDP (not even professionals can do this). Most satisfying to many, you also don't have to guess what you'll spend when you retire (although you could if you want - yes, the calculator is that flexible). Best of all, the Hey What's My Number? "Retirement Readiness" calculator automatically tells you the one number you want and need to know. It's your "Goal-Oriented Target" (or "GOT"). Discovering your own personal GOT allows you to see what you will need to earn each year on your retirement savings. You can take that number and, working either independently or with your financial adviser, determine how to invest your savings to achieve that GOT. Of course, your GOT is not written in stone. You can take actions to change it. Hey What's My Number? shows you how to do that. (See, I told you the Hey What's My Number? "Retirement Readiness" calculator was flexible ) While not ignoring the essential first steps, Hey What's My Number? takes you well beyond these. It demonstrates how many have used their 401k as the vehicle to carry them to retirement happiness. Experience the wisdom and insights of dozens of the leading retirement service professionals from all across the country and explore how you can retire in comfort. Along the Journey, You'll Uncover What Drives a 401k to Work So Well: - 4 Steps That Will Change Your Life - How to Retire a Millionaire (Hint: It's Easier Than You Think) - 7 Simple Saving Secrets Every 401k Saver Should Know - 10 "Don't"s of 401k Savings - The Retirement Saver's Secret Weapon - The 401k "Benefits" That Can Hurt Your Retirement Readiness - The Three Most Common "Over"-reach Mistakes of Retirement Savers - 3 (Bad) Reasons 401k Savers are Over-Cautious - The 2 Least Understood Investment Rules that Most Harm 401k Savers - Revealed: The Three 401k Strategies More Important than Your Investment Selection - The Secret to Retirement Success - A Warning to All Retirement Savers - Detecting These Signs Can Help 401k Investors Avoid a Fall - Why Everyday People Hate and Mistrust the Financial Services Industry - "Peril" - the new "Risk" - The New Way: Goal-Oriented Targeting - How Does Goal-Oriented Targeting Work? - Are You Ready to Retire? - Your Key Personal Data - How to Assess Your Personal GOT - 5 Things to Do to Improve Your GOT Depressed because your investment returns have lagged? When you buy my book, you'll find this matters less than you think and, much to your delight, you'll unearth the simple way to overcome this apparent shortfall.